Our world will yet become so intricate that it will be as ridiculous to believe in a god as it is nowadays to believe in ghosts. Although Lichtenberg investigated electrical phenomena and is credited with discovering “Lichtenberg Figures,” he is probably most widely known for his aphorism, pithy observations on the natural and social world around him that fill a number of notebooks, Sudelbücher as he called them in German. While his prediction about a belief in god might one day be accurate, his claim about how ridiculous it was in the 1770s to believe in ghosts seems to have been unfounded (or perhaps only locally true). A careful investigation of any reports, resting on strong testimony, regarding apparitions at the moment of death, or otherwise, or regarding disturbances in houses reputed to be haunted. To realize this goal the Society of Psychical Research set up the “Committee on Haunted Houses.” In the first volume of the Proceedings of the Society of Psychical Research the Committee published a detailed report on two reportedly haunted houses. But first the authors of the report laid out their criteria for assessing alleged hauntings, which included efforts to distinguish between apparitions and “ordinary hallucination[s]” and finding corroborating testimony or external evidence. In the case of corroborating testimony, the committee recognized the possibility that “several persons [could] misinterpret the same phenomena in the same manner, exemplifying what is called ‘collective delusion’.” And, of course, the committee had to trust the witness, which relied less on corroborating evidence and more on the social standing of the individual. 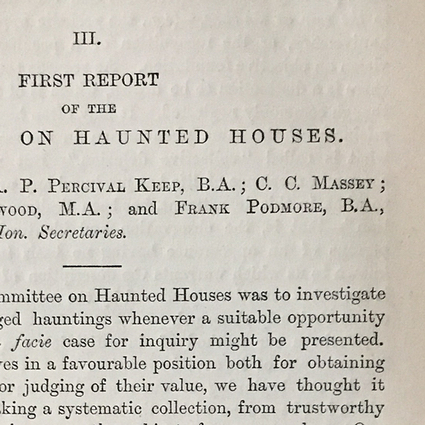 First report of the Committee on Haunted Houses, Society of Psychical Research. Apparently, in the 1880s England haunted houses were relatively common. 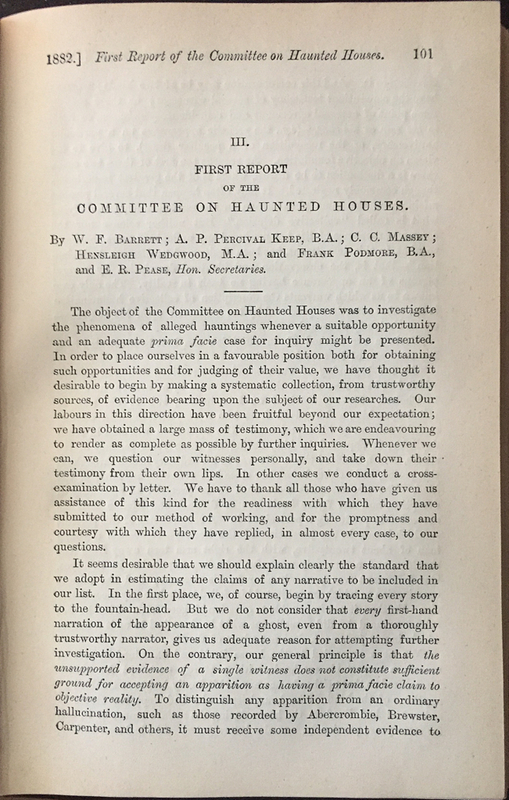 The committee remarked that their efforts to collect reports of haunted houses “has been fruitful beyond our expectations; we have obtained a large mass of testimony.” Many of the subsequent volumes of the Proceedings included long and detailed reports on haunted houses. In the first report, the committee analyzed two cases of haunted houses in order to present their methods of investigation and, it seems, to demonstrate their general skepticism about ghosts. At first Mr. X. Z. was dazzled by the light, but when his eyes became used to it he saw, standing at the end of the passage, about 35 feet from him, an old man in a figured dressing-gown. The face of this old man, which Mr. X. Z. saw quite clearly, was most hideous; so evil was it that both expression and features were firmly imprinted on his memory. As Mr. X. Z. was still looking, figure and light both vanished, and left him in pitch darkness. Mr. X. Z. learned the following day that a previous occupant, an old man, had strangled his wife and then cut his own throat “on the very spot where Mr. X. Z. had seen the figure.” Mr. X. Z. wasn’t the only person to experience something disconcerting. Another man who a year later had come to stay at the house, abruptly left after one night. He had been kept awake by “cryings and groanings, blasphemous oaths, and cries of despair” at his bedroom door, “the spot where the murderer had committed suicide.” Finally, a few years later, Mr. X. Z. was in London visiting the owner of house. While there he saw a portrait and claimed it was the same face he had seen on the apparition. The painting was a portrait of the old man who had murdered his wife and then committed suicide. The committee would not easily be led into believing this was an actual ghost. Instead, they adopted a more skeptical position, offering only a summary of the evidence. The second case was, again, a haunting linked to an unfortunate death in a House, in this case a young woman. In this case the committee amassed considerable testimony—six different witnesses of “high character” had in a “plain and straightforward manner” claimed to have seen a “shadowy figure”—but the committee withheld judgement. It is unclear whether a disbelief in ghosts motivated the committee’s skepticism or a recognition that their audience would be unlikely to be persuaded prompted them to adopt an agnostic position. At least one member of the committee, Frank Podmore, had a nuanced relationship with the various claims to paranormal phenomena. He established himself as the Society’s resident skeptic. Over the years he would write a number of reports on haunted houses. 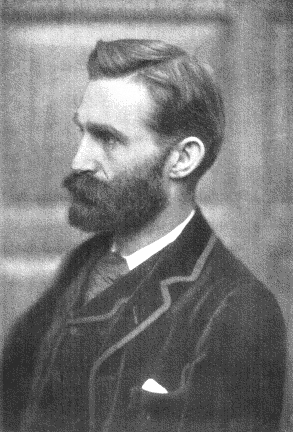 Frank Podmore, resident skeptic in the Society of Psychical Research. Whatever the final position the Society of Psychical Research adopted with respect to ghosts and haunted houses, Lichtenberg was clearly mistaken when he dismissed as ridiculous society’s belief in ghosts. Ghosts and apparitions were alive and well at least a century later.